I bought this rice cake today, thinking it was a regular cake made with rice flour and because it was very colorful. Unfortunately, it was inedible without much taste. The texture was hard like really stale mochi. I couldn’t believe that anyone could eat it. The package said to eat it within 24 hours. Is it supposed to be a soft product? Yes, the cake is supposed to be very soft and fluffy. It tastes better homemade also. It is made with rice flour-short grain rice flour that is SUPPOSED to be shifted very finely to give it the fluffy and moist texture. Maybe it’s just the cake you bought or the distributor. Hmmm, that’s interesting. AMAZING SITE— but you have to be able to read hangul. I am also looking for the recipe of this rice cake. This is one of my favorites and even though they sell it in the place where i am currently living, it’s quite, well very unreasonably expensive. Please tell me the recipe of this rice cake as soon as possible. 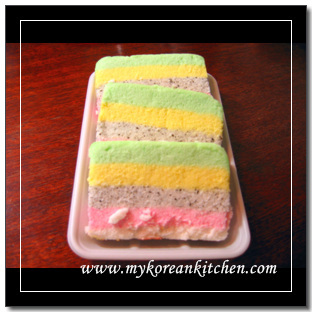 I understand that you have not tried to make the rainbow rice cake because you can buy it, but I am not able to buy it anywhere around where I live. I really need to learn how to make one but none of the Korean Cookbooks that I have even mention it and I can not find a single recipe online. Could I use a regular rice cake recipe? Sorry, I don’t have a recipe for any of the rices cakes. So far it’s been easier and cheaper to buy them instead of making them. Perhaps I will try making some one day, but that will be quite a while yet. i haven’t eaten this in a very long time.. it’s been ages since i seen it. i think these are the best rice cake that i have eaten so far..
i was just wondering if u have the recipe for this dessert..i’ve been looking everywhere for the recipe but couldn’t find one. if possible can you send me the recipe.